Following my recent hamper review, I am pleased to be back with a giveaway from Serenata! I am giving away one Chocolate Hamper from Serenata Hampers. 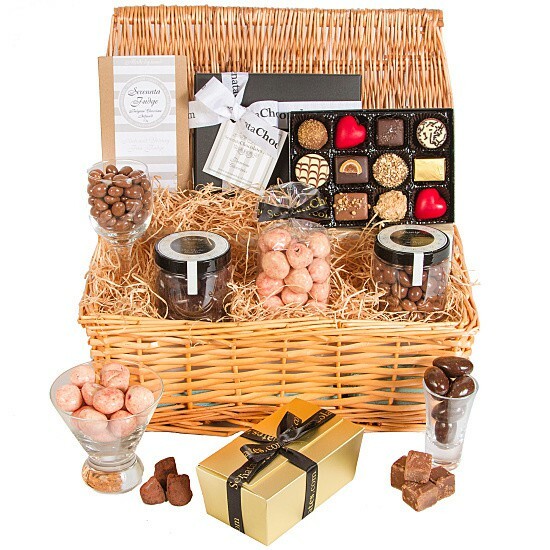 This hamper looks absolutely delicious! This hamper has few ingredients, but – oh – those it has are good! How does chocolate covered nuts, chocolate covered strawberries and Belgian chocolates grab you? A decadent selection for the sweetest of tooths. To be in with a chance of winning this competition, please visit Serenata Hampers, and then leave a comment here telling me the name of your favourite hamper from their range. Record your entries in the Rafflecopter widget below. This giveaway ends at midnight on 16/08/15. Entries submitted by Rafflecopter will be checked & verified, and false entries discounted. Good luck! Such a hard one, but I think my favourite is the Sweet Nothings Trug – though the Starving Student Survival Hamper did make me smile! The Sweet Treats hamper looks lovely! Champagne and truffles, is there anything better.